As I mentioned in my last post, I’ve been on a lucky streak recently! Considering I am usually such an unlucky person, this is quite a welcome change. My normal day to day life pretty much consists of various embarrassing, clumsy and just plain annoying incidents followed by me whining about said incidents to whoever I can coarse into listening. It really is rather nice to have something other than ‘oh I fell down a hole today’ to talk about. One of those lovely little blessings was winning a wonderful competition over at Tinned Tomatoes. The contest was named Pay it Forward and is quite a unique little idea as by winning you’ve agreed to pay your good fortune forward. I was lucky enough to win this delicious package of Scottish themed treats from Jacqueline containing loads of mouth watering goodies! I love the coasters. I took them to work for Kris and myself and they’ve received a lot of laughs from our north of the border customers. I can’t wait to try this sauce out. Doesn’t whiskey sauce just sound divine?! How lovely and what a really nice idea. I'm glad it cheered you up.You CANNOT be more clumsy than me. I got "banned" from gym class at school because I was a danger to myself and everyone else.. Beat that for embarrasment :redface:You can find the recipe for Scottish tablet on my blog if you want it. It's pretty easy to make.Love the coasters. 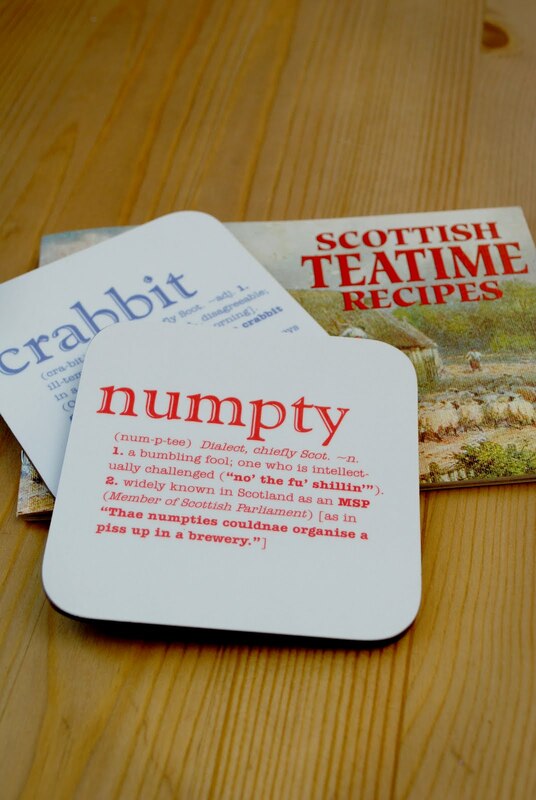 I'm Scottish (though now in Norfolk) and I've been meaning to buy a set of those for ages… ! What a lovely treat basket! I don't usually win anything either – once won a Weight Watchers dinner,oh dear! Love the coasters! What is a numpty? As a north easterner, cruelly transported to the East Midlands, I yearn for the North East and all the lovely food there! Fentiman's Ginger Beer… stotty cakes…Craster kippers! (Though I dare say they would pong a bit in the post!